I crafted our Second Great War alternative-history setting to maximize battleship action. I also wanted a more-or-less believable story arc, and I wanted to erase the Nazis. Because I hate Nazis, original or neo flavor. And so the great empires of 1914 have survived to struggle again in a new generation’s war. All of the major powers have battleships at the core of their fleets. 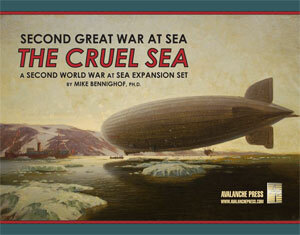 In our massive expansion set, The Cruel Sea, the fleets are those of Imperial Germany, France, and Imperial Russia. In our background story, Imperial Russia had a late start to the dreadnought race following the massive dislocation and disruption of the Great War. While the other powers laid down new battleships immediately after the war or resumed construction on those suspended during the conflict, Russia lacked the financial means to do so. That changed over the decades that followed, as peasants streamed into the cities to help fuel a massive economic expansion. At the naval limitations talks held in Vienna during the early 1920’s Imperial Russia obtained the same allotments as the great naval powers: Britain, Japan, the United States and Germany. The Imperial Navy had to spread those allotments over four fleets, in the Black Sea, Baltic, Arctic Ocean and Pacific, that could not be expected to reinforce one another. Each would have to fight on its own, and the Russian command chose to spread its resources among them, with the Baltic Fleet larger than the others and the Arctic Fleet the smallest. War came in August 1940, with a Russian attack on Poland, Finland, Austrian Ukraine and the Baltic States. France, Italy and Belgium soon joined the war on the Russian side. The Imperial Russian Arctic Fleet numbered four battleships, three battle cruisers, four large coast-defense ships, two helicopter carriers, 18 cruisers, six destroyer leaders and thirty destroyers. The first new Russian battleships following the Great War were only laid down in 1925, following a design prepared in 1917 by the naval architect V.P. Kostenko and intended for the Black Sea Fleet. The design incorporated the lessons of the Battle of Jutland, as best as Kostenko could piece together form the fragmentary information available to the Russian Navy. Kostenko (that’s him over there on the right) had been chief engineer of the battleship Orel, lost at Tsushima when he was only 24. After his return from captivity in Japan he went to England to supervise construction of the armored cruiser Rurik, and later attempted to enlist her crew in a scheme to assassinate Tsar Nicholas II. 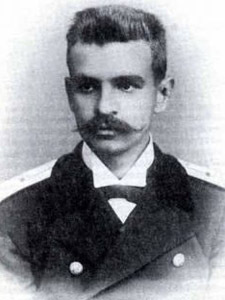 He went to a tsarist labor camp, and began drawing battleships for the Black Sea Fleet’s design bureau after Nicholas pardoned him in late 1911. In the history we know, Kostenko became a well-known Soviet naval architect whose career would be interrupted by still more prison terms thanks to his pre-1917 membership in the Socialist Revolutionary Party (which put him under suspicion in the eyes of the Old Bolsheviks). Under Nicholas’ son Alexei, the tsar in our Second Great War story arc, Kostenko might have fared even worse. When not dodging the Tsar’s secret police, Kostenko drew four variants for a large, modern fast battleship. Design Number Two appeared in our Jutland game, and is the version chosen for The Cruel Sea as well. Kostenko’s battleship was huge, narrow and long: 44,000 tons’ displacement, 240 meters long and 30 meters wide, designed for a speed of 30 knots – roughly the same specifications as the massive German L20e design, which also appears in The Cruel Sea, though with a more slender hull than the German ship to help promote her speed. Her layout compromised between the “Cuniberti” arrangement with all main gun turrets on the main deck level, used in prior Russian battleships, and the fore-and-aft layout preferred by most foreign naval architects. The main armament of nine 16-inch guns would be carried in triple turrets, two of them forward and one aft. The second, “B position” turret was not superfiring – it was not raised on its armored barbette above deck level to allow it to fire over the forward, “A” turret. Kostenko’s sketches showed that an elevation of 10 degrees would be sufficient to allow B turret to fire directly forward. Based on the data collected regarding Jutland and the handful of surface engagements waged by Russian battleships (chiefly, the battles of the Black Sea Fleet with the German battle cruiser Goeben), gunnery combat would be fought at much greater ranges than had been the case in the Russo-Japanese War. Therefore, Kosteno argued, the extra weight allotted to raising B turret’s barbette could instead be used to thicken protection elsewhere. The two forward turrets each had separate magazines, but in Kostenko’s design the magazines shared armored protection with the rest of the ships “citadel.” It’s not clear from the sketches whether he intended that shells and charges be passed between the magazines. The experience of Jutland showed that a single magazine explosion would utterly destroy a ship; Kostenko thought it best to instead provide a thicker layer of armor around both. To achieve the design speed of 30 knots, the ship required 120,000 horsepower driving four shafts. For protection, her 15 huge boilers were split among five boilers rooms. Kostenko paid close attention to underwater protection, giving his ship a double bottom and deep protective “crush zones” against torpedoes. Despite the weight-saving of the flush-decked turret arrangement, in keeping with Russian practice armor remained relatively light, with a belt 275mm thick compared to 350mm for the German L20e design. The last Russian battleship laid down before the Revolution, Imperator Nikolai I, had a belt of 270mm, a substantial increase over the first, thin-skinned Russian dreadnoughts. In addition to the nine 16-inch guns, Kostenko’s battleship carried a secondary armament of twenty 6-inch guns, twelve of them in twin turrets (three along either flank) and eight in casemates (four at either end of the ship). In a radical forward-looking departure from world-wide design practice of the time, she carried no torpedo tubes. Kostenko’s ship, despite her impressive looks and massive firepower, carried several inherent flaws in her design. He had made her very long to boost her speed, which in turn required a very long armored belt. To bring the armor within a reasonable weight he went with a thinner belt and stretched it along the entire length of the ship, at a time when American naval architects had hit on the “all or nothing” practice which left areas like the bow relatively unprotected in exchange for much thicker protection over the ship’s vitals. Did Kostenko intentionally draft a flawed ship? The armored cruiser Rurik, built under his supposedly watchful eye, had so many structural problems that the Russians demanded a refund and cancelled contracts for sister ships to be built in Russia. Yet German practice took the side armor close to the ship’s bows as well – the Germans attributed the loss of the new, otherwise superbly-designed battle cruiser Lützow at Jutland to progressive flooding from damage to her inadequately-protected bow. In the Second Great War alternative history, Kostenko’s design is laid down for all four Russian fleets starting in 1925 and becomes the standard battleship of the regime he so detested. Two of them appear in The Cruel Sea. They remain relatively fast for their age, and have been modernized. The casemate batteries have been removed, and the 6-inch turrets reduced from six to four. The ships have received thicker deck armor and anti-torpedo blisters along their hulls, but little can be done about their inadequate belt armor scheme. Most noticeably, the three funnels have been trunked into one large one, and the generous boat deck cleared away to provide space for a large helicopter deck and hangar above the huge engine rooms. The result is an impressive ship when seen at naval reviews, but hiding serious weaknesses beneath her skin. We included four examples of Kostenko’s ship in Jutland, but did not use them in any scenarios. That’s corrected in Jutland 1919, where they can fight their German contemporaries. You can order The Cruel Sea right here, right now.